What’s So Great About Ikea (Besides the Prices)? Today I shopped at Ikea for the second time in my life. I almost wish I hadn’t stopped there after dropping my parents at the Portland Airport. But that adjacent towering yellow and blue sign beckoned. I just find it to be a headache-inducing place that urges you to buy way more cheap made-in-China crap than you need. But their prices can’t be beat. Ikea is also sparsely staffed and a confusing maze to new customers. I spent forever measuring out components for a mirrored-bathroom cabinet, only to learn when I went to fetch the pieces from the self-serve area that those mirrored were discontinued. But you don’t want to come home empty-handed after wasting your time there. I was also bothered by the layout of the Ikea store, which forces you to walk through different showroom areas (living room, media storage) on your way to the exit just to convince you to buy items you didn’t know you needed. Am I being too harsh? The $1 Swedish meatballs and 50-cent beef hot dogs served at the Ikea snack bar are a bargain lunch. And of course both of my second-hand couches originally came from Ikea. I just didn’t have to go through the trouble myself to get them. Do you avoid Ikea or deck out your apartments and houses with their loot? I love this blog- it’s like a private boutique newspaper/magazine. Keep up the great and enthusiastic reporting on your forays discovering all the jewels in Oregon. I’ve been working to de-Ikea the house, and have only two inoffensive wood bookcases left. And I think they’re still good for small parts, like shower curtains, light bulbs, and tool kits, which they discount for the sake of getting you to enter their labyrinth. I like the way you put that! Now if I could only get someone to pay me to do this! Thanks Ben! I didn’t even research their corporate practices: this was more of a personal rant. I agree they are better for fixtures and smaller pieces, such as the $1.99 turquoise cutting boards I got. Do you think their products are less well-made than they used to be? Certainly fewer, if any of the products, are still made in Sweden. 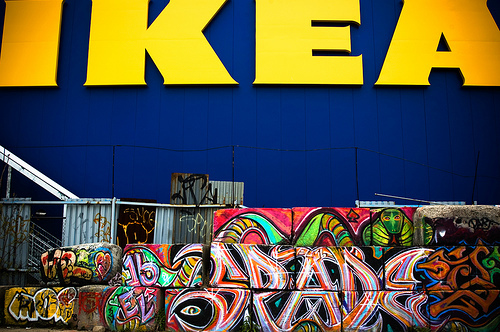 i am also on the fence about ikea because i don’t like supporting giant corporations. if i see something i like at ikea, because it is well designed or cheap (or both) then i first try searching craigslist for “ikea” and i can usually find it second-hand… such as a bookcase (new $50/ used $25). i like your blog laura, and not just because it is free! Yeah I’m on the fence too. I mean I chose to shop there. But I just feel manipulated when I enter their stores. Craigslist is always a good way to o. One of the best things IKEA has going for it is the eco-friendly flat-packing strategy. One of the worst things IKEA has going for it is the flat-packing. No more assembly, please! Yeah I did notice their Portland building is all LEED-certified and eco-friendly and I’m all for limited packaging. I guess just both times I’ve been to IKEA I didn’t have hours to spend there and got frustrated when I couldn’t find things. I think to save time I will go straight to the self-service warehouse area where the items are flat-packed. Have you all returned items there? Hope I won’t have problems when I need to take some things back. Laura! So harsh! The Ikea hatred. I used to hate them too. Having to go find your own big box (which sometimes they don’t actually have) is very frustrating. But they keep the prices down by being ‘understaffed.’ And show me a place where I can buy a nice sturdy six shelf bookcase for less than a hundred dollars and I will be tempted to shop there instead. Meanwhile, I always research online first, and have learned to enjoy the meatballs and the stroll through the kitchen area – they do have some great designs in there for really really cheap. My cheese grater is a marvel, and designed by Ikea. OH!and it’s the only place I know of where you can buy a lamp for less than 15 dollars.